NOW: In order to see over the well-packed “East Lawtonwood” Jean Sherrard took his “now” from near the north end of 42nd Ave. Northwest, about 100 feet above the waterway. Behind him in “West Lawtonwood” the homes are often much larger and the lawns too. 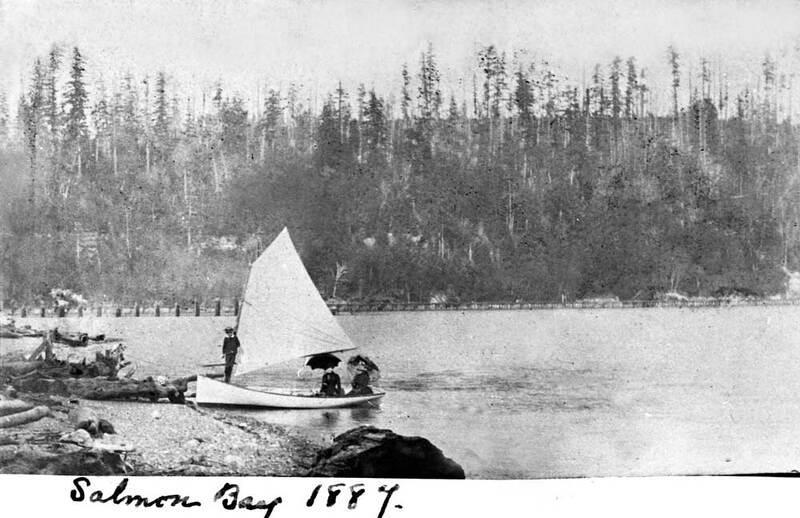 Carolyn Marr, the librarian at the Museum of History and Industry (MOHAI) and an authority of the photographer Anders Wilse’s years in Seattle, thinks that this his look east through the entrance to Salmon Bay – from Shilshole Bay – was probably taken in 1900. That was Wilse’s last busy year in Seattle before he returned to Norway. 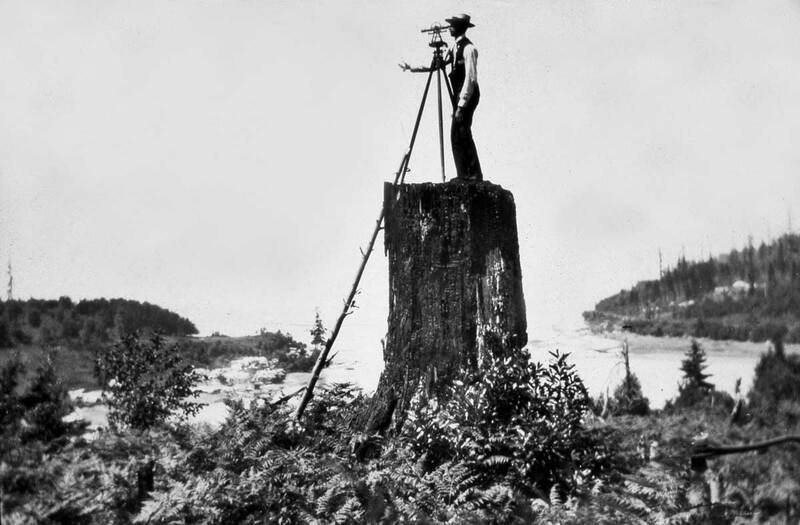 During his few years here Wilse received many commissions from businesses and the City of Seattle to do photographic surveys. But why did he record this bucolic view over a Lawtonwood pasture with seven cows? It was not long after Wilse recorded this view of the channel that the Army Corps started dredging it in preparation for the ship canal. Throughout the 1890s smaller “lightening ships” hauled cut lumber from the many Ballard mills on Salmon Bay to the schooners anchored in deep water off of Shilshole Bay. No vessels here, however. The channel is near low tide. You can make out the sand bars. The home of Salmon Bay Charlie, a half-century resident here, can be found to the far right. With irregular roof boards it may be mistaken for part of the shoreline. Charley was one of the principal suppliers of salmon and clams to the resident pioneers on both sides of this channel. 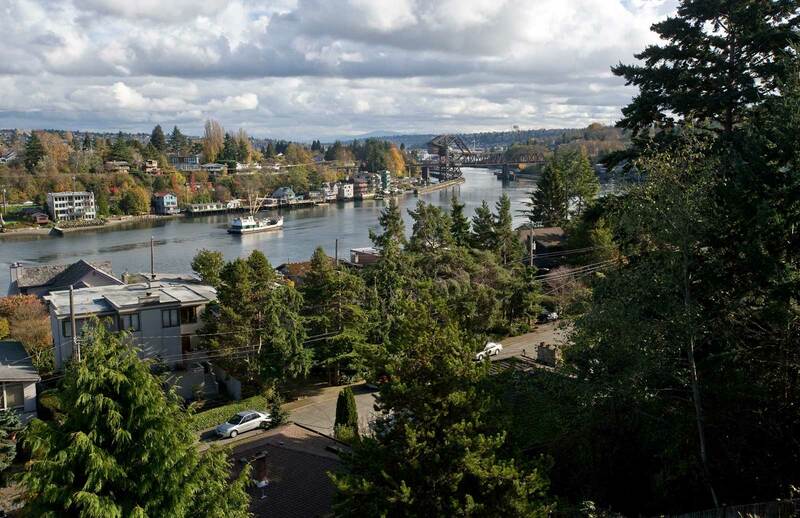 Wilse gives us a good look across the tidewaters into a west Ballard that while clear-cut is still sparsely developed. 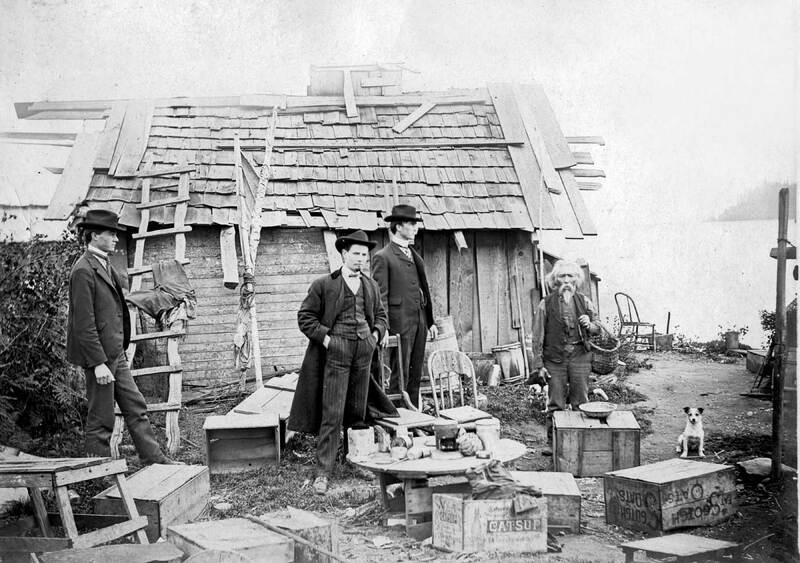 The Bryggers settled and developed that part of Ballard, and the few structures seen there may belong to them. One last note: those may be Scheuerman cows. The German immigrant Christian Scheuerman and his native wife Rebecca were Lawtonwood pioneers. Settling here in 1870 they multiplied with 10 children. Once again guided through the back streets and secret passages of Magnolia, the inestimable Jon Wooton led me to the spot near where Wilse’s ‘Then’ photo had been taken. 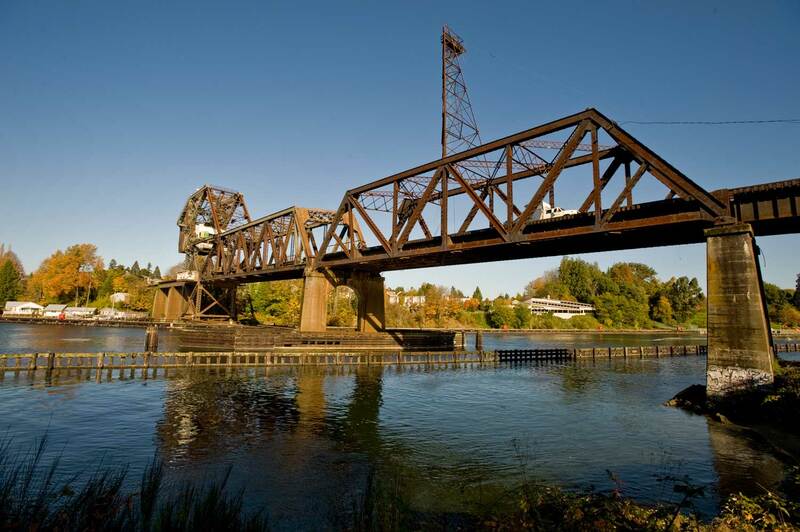 The following closer shots of the railroad bridge were taken on return trips over the next couple of days. Another Wilse view, like the one at the top. This is from the north side of the bay and so looking southwest past the Lawtonwood head in the direction of West Point. The two sandbars beyond what may be a dugout canoe were two of the remembered features that were dredged away with the building of the Lake Washington Ship Canal. Next – if we may – we will reflect on what changes along this way must have transpired in the mere 60 years between the above the photograph and the one that now follows. Before there was the Space Needle there was the Kalakala – serving as the principal symbol of Seattle and Puget Sound. The ferry was introduced in 1935 to help locals take their minds of the Great Depression. 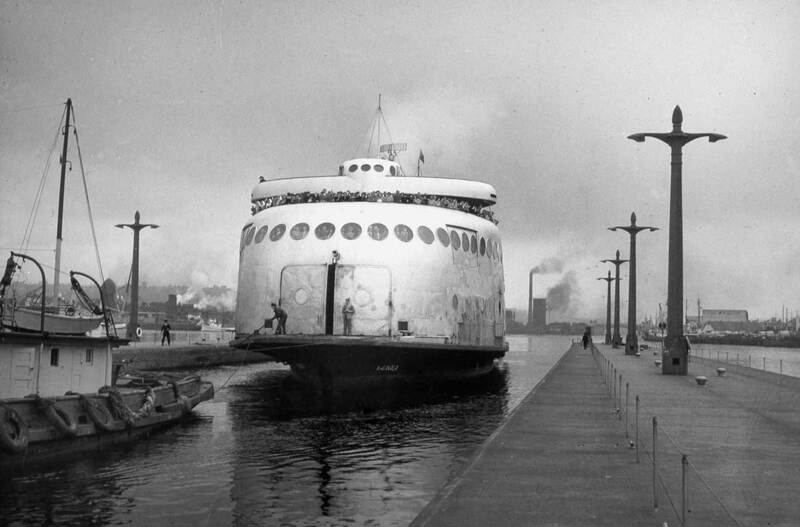 The Black Ball Line named her after the native Indians’ mythical “flying bird” and advertised her as the “world’s first streamlined ferry.” The publicity worked. Puget Sound’s first streamlined symbol was known from Peoria to Peking. The tear-shaped vessel was first sketched by the avant-garde industrial designer Norman Bell Geddes, and so apparently not by a Boeing engineer as is widely believed. Bell Geddes managed to design an auto ferry that did not resemble a steam-powered garage. The Kalakala’s aluminum skin was stretched over the burned-out hull of the San Francisco Bay ferry Peralta, towed north in 1934 for its transmutation. 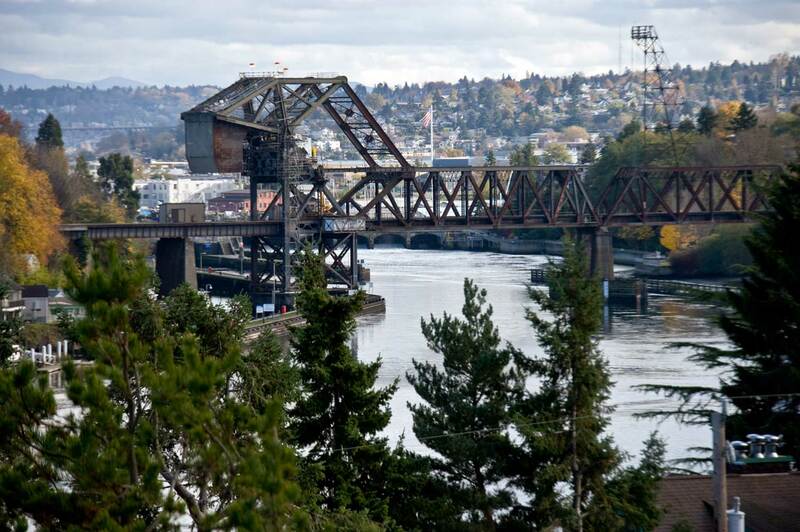 Ever since, persons of energy and imagination have labored to bring the “flying bird” back to Puget Sound, the waterway for which she was once an international symbol. Most recently this effort has been organized by the Kalakala Foundation. Salmon Bay Charlie's cedar plank lodgings appear in the featured photo at the top. Here is a close up, and judging from the number "75" it is a very early Webster and Stevens negative - perhaps 1901, and so recorded soon after Wilse had returned to Norway. This was first published in Pacific on January 29, 1984 - a quarter-century ago! - and for the now U.W. Architect and Discovery Park preservationist Frederich Mann led me to it. I asked him to be part of the "now" scene and he is part of it - but not here. As with so many other repeats from the years of doing this weekly business I have secreted it away from myself in one or another of scores of binders. I hope to find it. Fred was a wonderful mensch. The 1984 article follows. Salmon Bay Charlie and his wife lived in their cedar plank home on the south shore of Magnolia’s Salmon Bay. 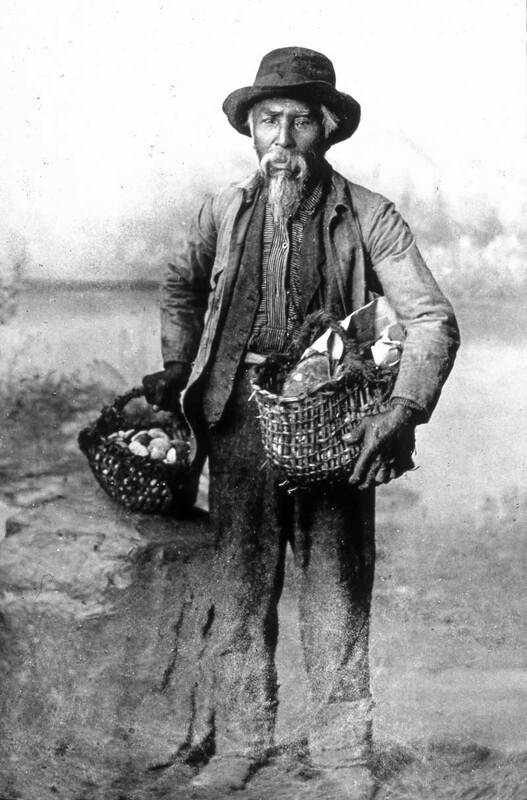 For half a century Charlie, also known as Siwash Charlie, sold salmon, clams and berries to the first settlers and later to the soldiers at Fort Lawton. Today’s historical view shows Charlie’s house at the turn of the century, taken by the photography firm, Webster and Stevens. Charlie’s native name was HWelch’teed, and he probably was the last of the Sheel-shol-ashbsh (hence Shilshole) group that centered on this once narrow Shilshole-Salmon Bay inlet to the fresh water interior. (“Sheel-shol-ashbsh” translates to “threading the bead,” which was descriptive of the canoe trip to lakes Union and Washington.) The Shilshole Indians were one of the eight or nine principal tribes who lived in what we now call Greater Seattle. 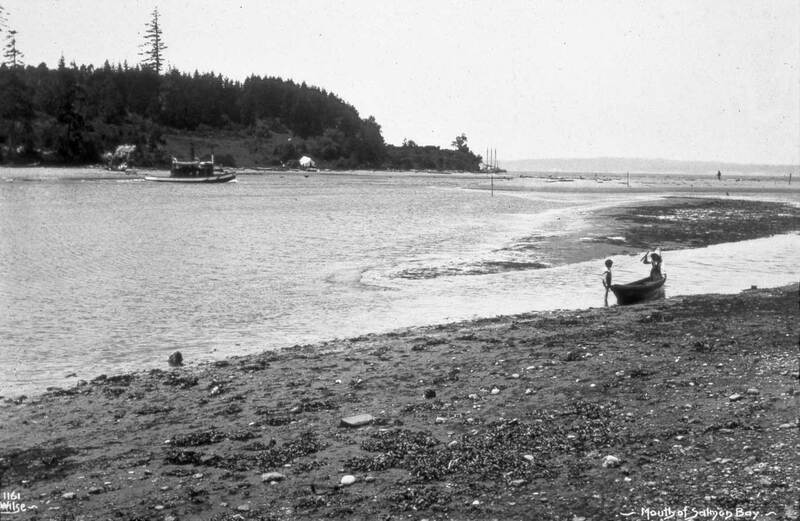 LocaI historian David Buerge has determined that this Salmon Bay site was once the center of a large community whose area extended from Mukilteo to Smith Cove. Here, long before Charlie’s shack was built, three long houses dominated the area. The largest house was big enough for potlatches, the gift-giving ritual ceremony. The Shilsholes went into a sudden decline a half century before ‘white settlers grabbed their land. 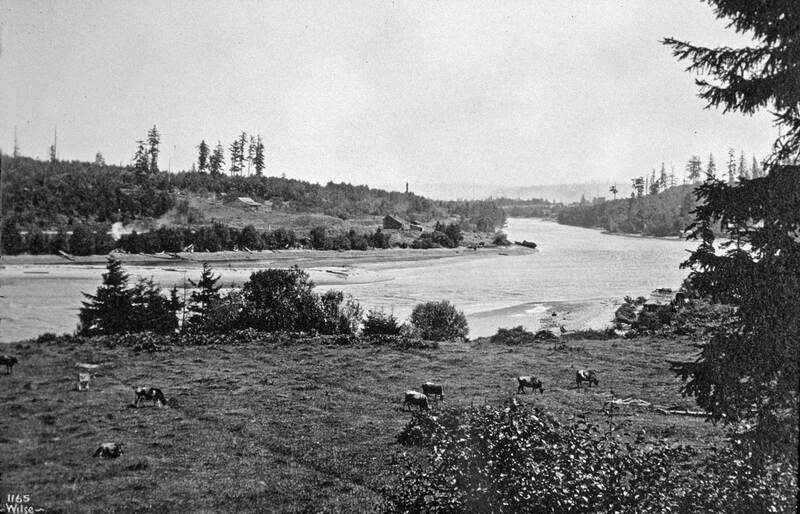 Once about 1800 of their numbers were ravished by “a great catastrophe,” most likely an attack by one of the slave-taking, booty-hunting and beheading North Coast tribes. By the time pioneer Henry Smith settled Smith Cove in 1853, the tribe had dwindled to a dozen families at most. By the late 1880s there were only two families left. Steady white settlement, started in the 1875 when German immigrant Christian Scheurman moved to the area, cleared the timber and married a native woman who had ten children before she died in 1884. In 1895 Seattle boosters organized to attract a military post to the area and gathered the acreage that is now Fort Lawton-Discovery Park. The part of it that is now Lawton Wood, shown in our contemporary photo, is not part of the military holding because Scheurman withheld it. Soon after the military moved in next door, this protected enclave was improved with mansions of a few of Seattle’s elite. In 1952 these neighbors – about 30 houses sparingly distributed about a generous 30 acres – organized the Lawton Wood Improvement Club waving the motto “To Beautify and Develop Lawton Wood.” By the time that the last of the Scheurmans, Ruby, moved out in the late 1970s the beautifying had turned more to developing, and the lots got smaller. Any attempt to, recreate the perspective used in the photo of Charlie’s shack would have put in the bay. 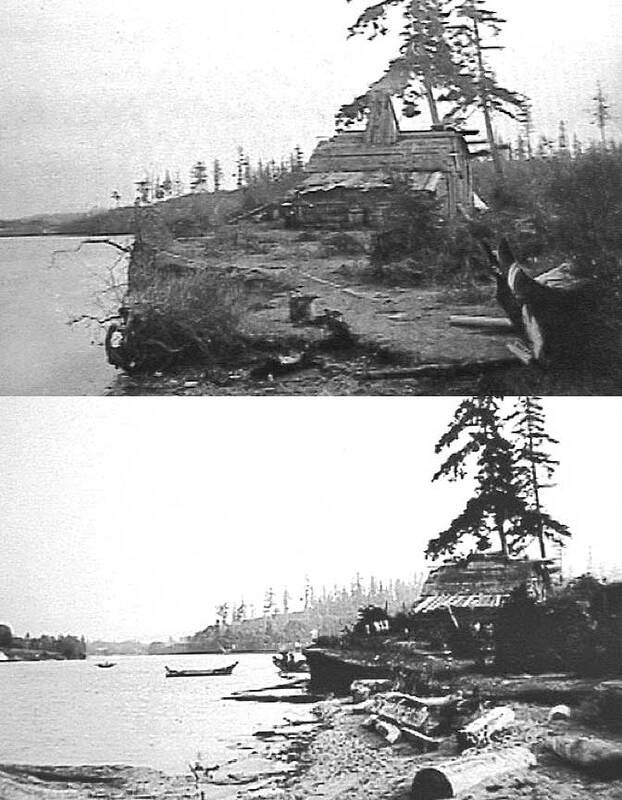 During the early part of the 20th century, deep-water dredging by the Army erased the old Indian’s promontory. The excavation revealed the many layers of discarded clam shells that piled up over the centuries of native settlement. 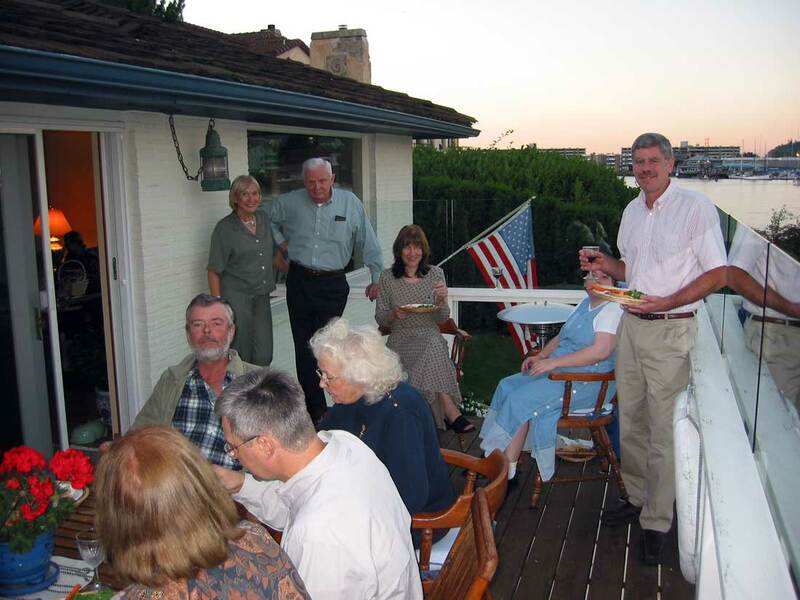 In 2003 I returned to the site to deliver a slide show lecture on Salmon Bay to members of the Magnolia Historical Society. We met in a member’s home that overlapped Charlie’s “property” broadly foot-printed. The new print of Charlie’s above – and his dog – had surfaced from a collection kept by one of the Society members, Russ Langstaff. Here first is the picture, followed by the feature on it that appeared in Pacific, also in 2003. Later this day – after I have finished writing this – I am attending a benefit for the Magnolia Historical Society (MHS) as they prepare to write and produce a second volume of “Magnolia: Memories & Milestones.” We will be meeting at the home of Betty and Tink Phelps and within whispering (that is, not shouting) distance of where the historical photographer stood who took this week’s “then” photo of three black suits visiting Charlie (or Hwehlchtid) the last of the Duwamish Indians to live on Shilshole Bay. Of course, while I am at the benefit I will photograph the contemporary scene (including some society members) printed here as a “repeat” of the historical photograph. Magnolian Russ Langstaff found this newest addition to the small store of Salmon (or Shilshole) Bay Charlie photographs while thumbing through the stock of images taken by both his father and uncle early in the 20th Century. However, it took two-time society president Monica Wooton, while searching for photographs to illustrate the MHS’s first book, to identify this scene as one of Charlie, his dog and his home. While the towering trio are not identified it has occurred to more than one “reader” of the photograph that perhaps these are the agents from the Office of Indian Affairs who removed Charlie from his home to the reservation soon after his wife Madelline died. That was at the time the Ballard (Chittenden) Locks were under construction. One source says 1915 and another 1916 for Charlie’s removal. Although, of all the historical maps of Shilshole Bay that have been found none mark the site of Charlie and Madelline’s home (city maps were generally made to sell property and not to identify and so perhaps help preserve native homes like Charlie’s), the several surviving photographs of this historical home lead us confidently to the Phelps back yard or at least very near it. 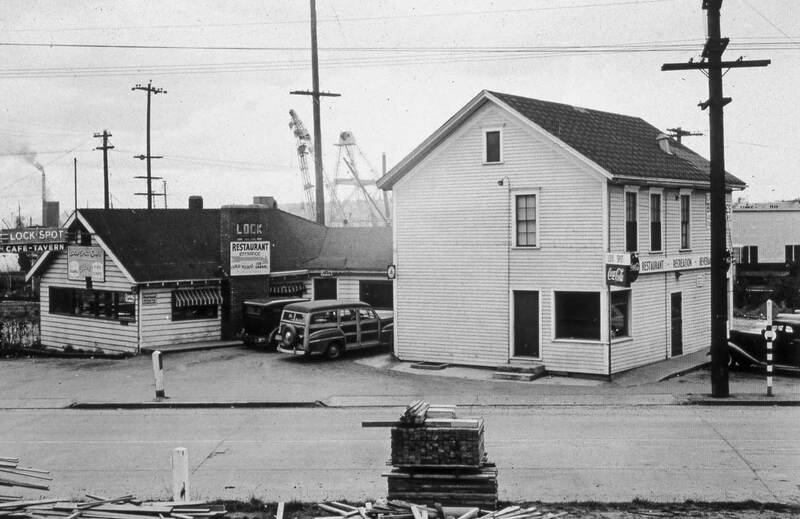 Now and Then Captions together: Until about 1916 when it was burned Salmon Bay Charlie’s home was a landmark fixture on the southwest shore or the Magnolian side of Shilshole Bay. Like the contemporary deck of the Phelps home, this sturdy shack of the last of the Shilshole band of the Duwamish Tribe sat on a promontory or knoll near the foot of what was later developed as Sheridan Street in the Bay Terrace Addition of the Lawtonwood neighborhood. The site was also dredged for a widening of the waterway into the locks. Two views of the home looking to the southeast. Before showing the homes of two of Charlies neighbors – those on the south and north sides of Chittenden Locks – we will pause to show a few more salmon. In Charlie's marketing years if a local settler had the time to do it catching one's own salmon was commonplace and often quick. 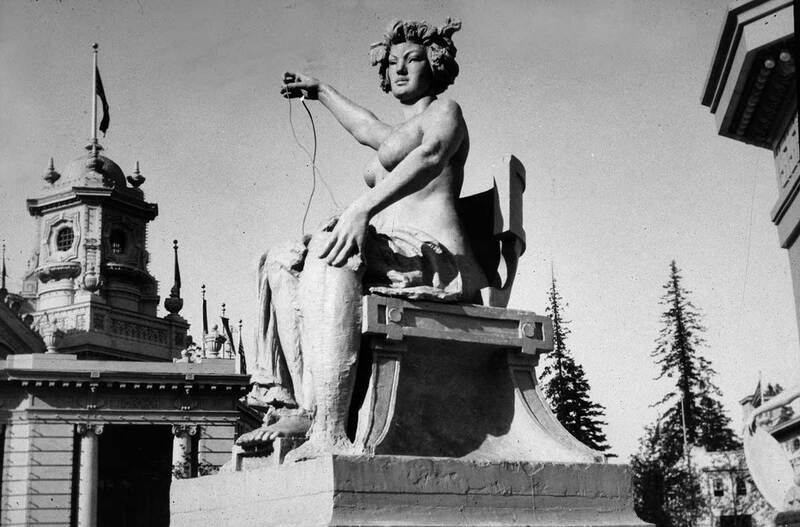 Included among the 1909 Alaska Yukon and Pacific Exposition's many plaster-paris figures was this heroic one of a commanding female securing a salmon with her left hand while holding high an electric wire with her right hand. The fish and the wire represented some balance of the past and the future, we imagine. 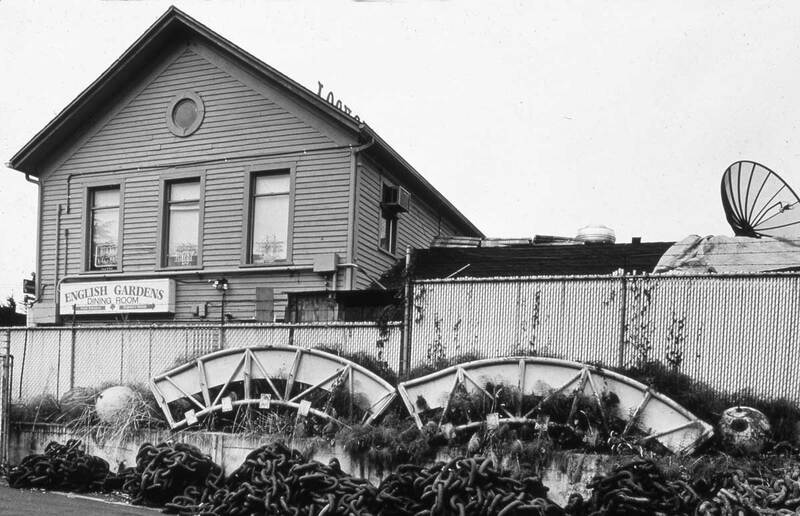 A subjectd loaned to us from the Ballard Historical Society with a caption that describes it as a scene of salmon processing in Ballard. The year must be guessed at from the uniforms. The labor boss, perhaps, seems to float - or lurk - in the shadows at the rear. 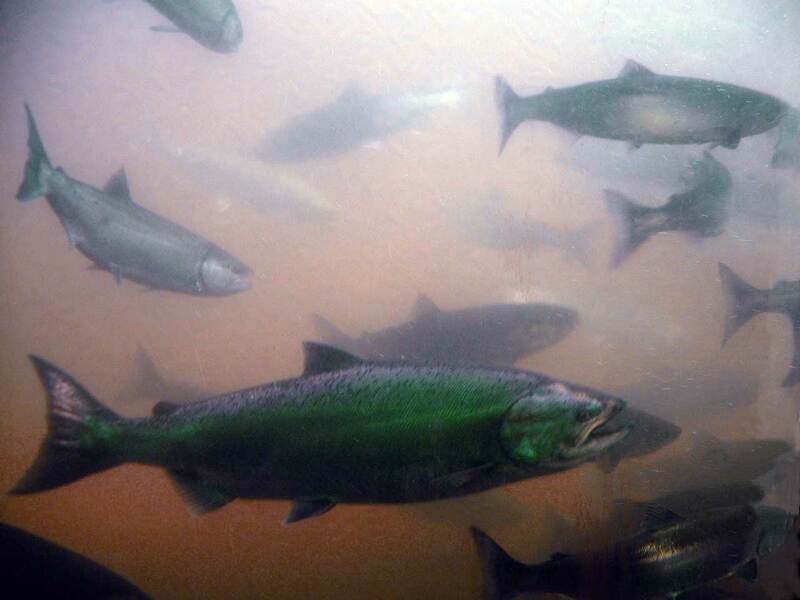 One of the favorite tourist destinations in Seattle, the fish ladder at the locks includes a viewing room where the lucky salmon who have made it past all obstacles - including the seals in the bay - have almost returned home. We use them also as a reminder that we mean to return to this site with another blog addendum, this time to show several scenes from the construction of the locks. Follows now two past Pacific features about Salmon Bay Charlie’s neighbors, the Shillestads on the Magnolia side of the locks, first, the the Bryggers on the Ballard side following. Ole and Regina Shillestad knew each other in Norway. As students, then married here in Seattle. They raised their four children on the south shore of Salmon Bay beside the site of the future Chittenden Locks. The couple acquired this land in 1876. Four years later they built their home here and planted an orchard of about 30 trees: plum, pear and apple. A sliver of the orchard is evident on the left just behind the fence built above the high-side line. A skilled Norwegian carpenter, Ole built the home himself as well as that of his neighbors, John and Anna Brygger, who lived just across Salmon Bay. (The Brygger home, which survives as part of the Lock Spot Tavern.) Both homes were ornaments with Shillestad’s hand-cut details. 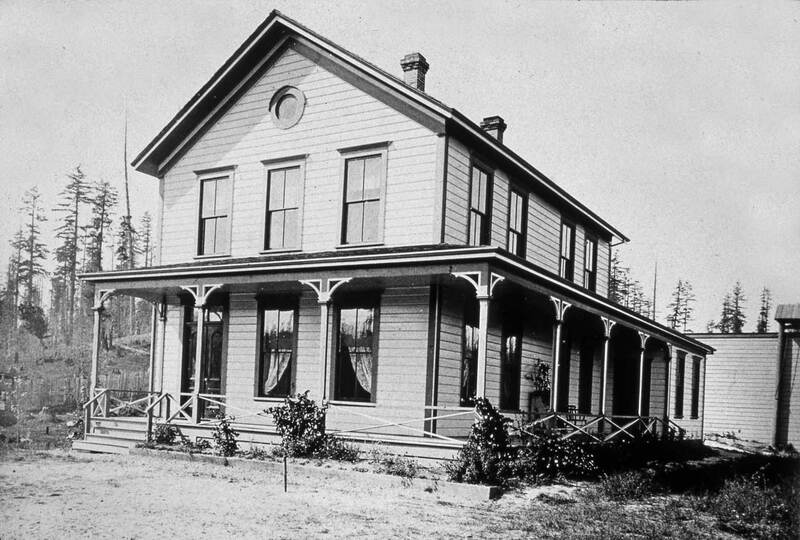 After the family moved to lower Queen Anne, the old home was rented often to caretakers of what remained of the old Shillestad family property. 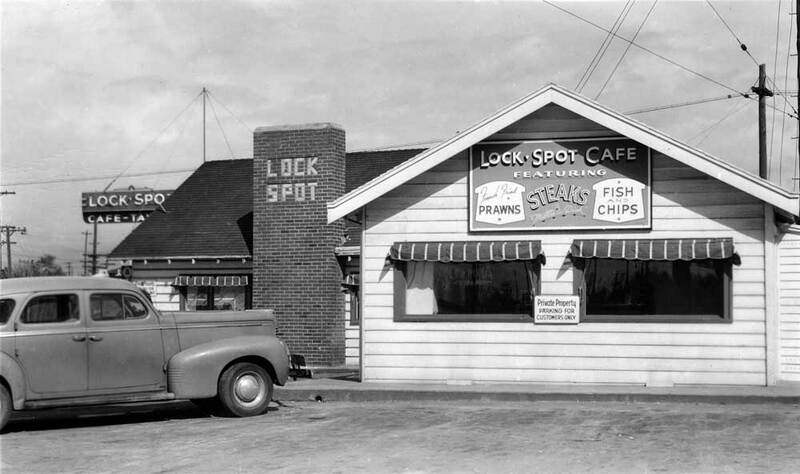 Commercial development of the south shore began shortly after World War II, and for a time June Shillestad and her brother operated the Sealth Souvenir Store and Lunch Counter alongside the spillway dam. The family home survived until the mid-1970s, when it was replaced by the apartments that now look down on Chittenden Locks. Another look across the Salmon Bay waterway before the Locks and to the Shillestad's home framed by snow. The Brygger home as Lock Spot - part of it - in 1991. Anna and John Brygger moved from their log cabin in 1887 into this, their first finished home. The lumber for it was logged from their homestead on the north bank of Salmon Bay, towed to Seattle for milling and then rafted back for construction. John died the following year, but the much younger Anna lived until 1940. Before his death at age 65, Brygger had his successes. 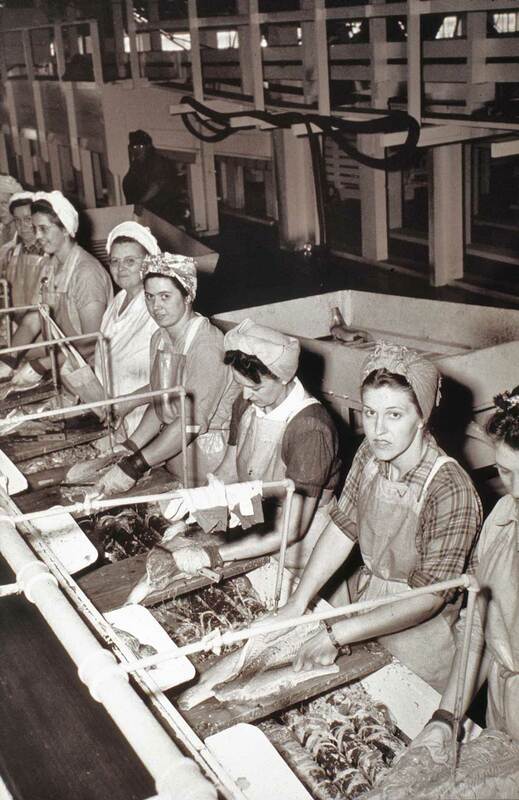 He was one of the first to try commercial fishing and canning on Puget Sound. In the summer of 1876, the Intelligencer (a predecessor of the Post-Intelligencer) reported that “Mr. 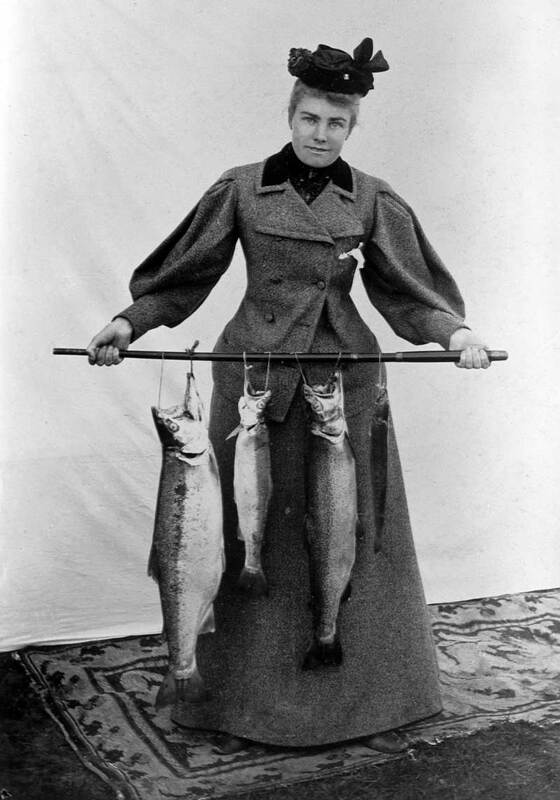 John Brygger, a Norwegian capitalist and fisherman, has purchased a site on Salmon Bay about six miles north of the city, where he has already commenced the business of catching and canning salmon.” His skill was such that he was able to open a bank in his native Norway with earnings. This banking confidence he passed on to his son, Albert, who later became president of Seattle’s Peoples National Bank. The "official" Helix delivery van was a wood sided station wagon like the one above parked between the two wings of the Lock Spot. (Again, the one on the right is the old Brygger home.) But those Helix deliveries began in 1967. This view is what year? 1951? I was then in my last year at Spokane Lutheran Primary School. This is now added by Ron Edge of this blog. This is that part of the Lock Spot that is not the Bryggers home. Depending on the width of the lens it may be the earliest of the three Lock Spot photos shown here, and taken from the future site/lot of the Bryggers home before its move ca. 1948. 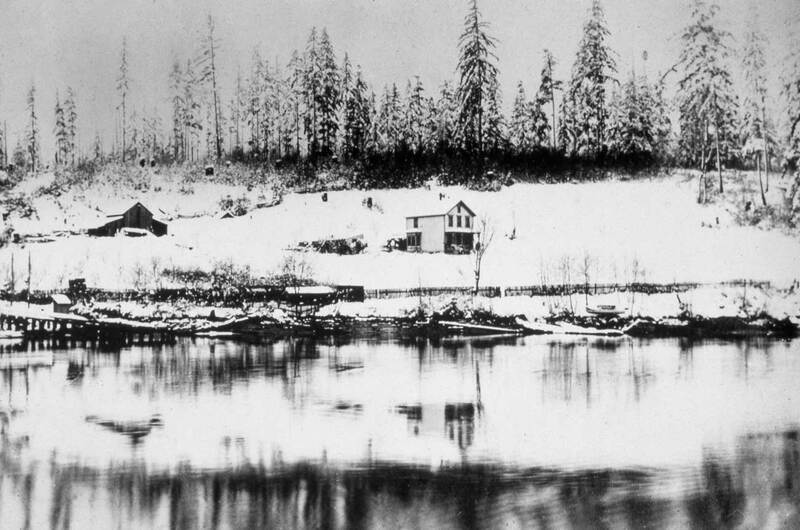 The Brygger home was built on a knoll a short distance north of Salmon Bay – and the future Chittenden Locks – near the present intersection of Market Street and 30th Avenue Northwest. In 1948 the site was condemned to allow the extension of Market Street west from 29th Avenue Northwest. Frank Canovi, Lock Spot Tavern owner, bought the Brygger home and moved the oldest part of it less than 100 yards south of the original site to his popular beer parlor. Mr. Dorpat, you have no idea how fortuitous this article is for me! I am a Board Member of the Kitsap County Historical Society and am spearheading the reprinting of ‘Kitsap County: A History’ published in 1977. 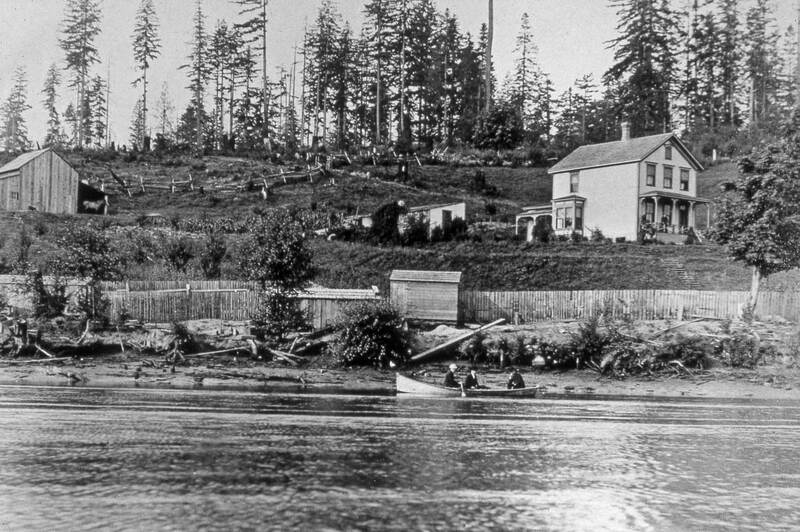 In the section on North Kitsap (Book II) we have two photos labeled as Chief Seattle’ home and Princess Angeline’s home. The reference for the photos is ‘Souvenir of Chief Seattle and Princess Angeline’, published in 1909 by Laura Buchanan. Neither photo looked right to me so I tried to track down the Buchanan book, but was unsuccessful. I did, however, come across a Skagit Journal review of Coll Thrush’s ‘Native Seattle: Histories from the Crossing-Over Place’. 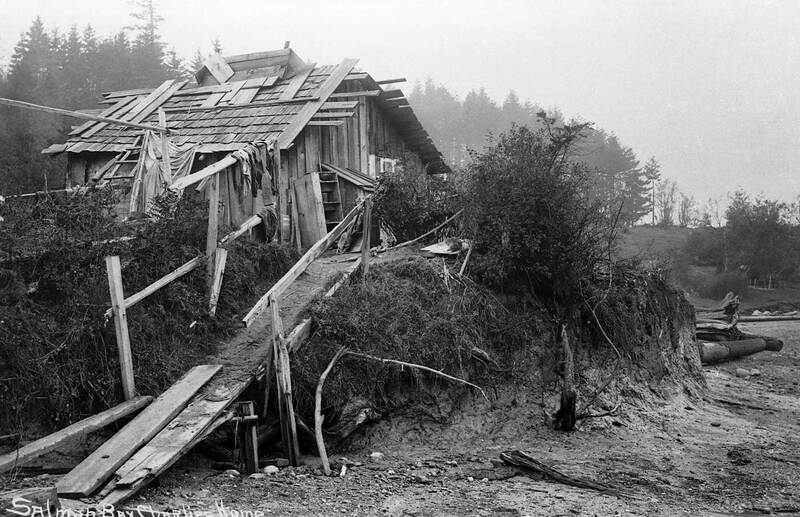 In it was a photo labeled as an indian home in the area of the Chittenden Locks, razed in 1914. It was only slightly different from the photo we had labeled as ‘Chief Seattle’s home’, obviously taken at a slightly different time. In reading your article, and looking at the photos, it would appear that both our photos are the same building(from the north and the south), that is Salmon Bay Charlie’s house! Now my question is – where did Laura Buchanan get her information??? Do you know anything about her? I found that the Seattle Public Library has a copy of the book in Special Collections (10th floor). It has no name of a publisher and no information about the author. I’m curious about her because she goes into great detail about Angeline being abducted by a French-Canadian trapper who took her inland at the Canadian border area, where she lived for 12 years (and mistreated her). After his death by stabbing she returned to her people with her daughter (I’m assuming that’s ‘Lizzie’). I have never heard that story before, or any mention of the possibility. I’m inclined to ignore it, especially now that the photos have been shown to be mis-identified. If you have any further infirmation I would love to have it – not for publication but for my own peace of mind during this editing nightmare! I can be reached at this email address at weekends or by phone during the week at 206-842-7343. I trying to figure out if this Salmon Bay Charlie could be a descendant of the Salmon Bay Curley, mentioned in several histories as the one who warned settlers in Seattle before the 1856 atack. A relative, cousin, possibly the same person! Have to be in his 90’s I guess to be the same person — but does anyone know? In historical books they like to change up the names and as I myself am a descendent of Salmon Bay Curley. I am very positive this is Chief Salmon Bay Curley. I just came across your message from Jan 2016, in reply to my question from 2011. I have been doing some research on the Scheuerman family that Dorpat mentions here, and would be interested in finding out more about your info on this.